This Post has already been read 790 times. Mobilink Foundation has launched the ‘Teach 2 Transform 2014’ (T2T) initiative to educate the underprivileged across Pakistan for a second consecutive year. 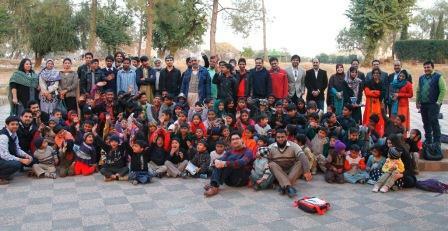 The program aims to involve Mobilink Torchbearers to offer teaching assistance at marginalized schools in the country. The program was formally launched in Islamabad at an open air park school with several Mobilink Torchbearers participating to teach students ranging from age 4 – 15. The school is the first of its kind in Islamabad being run under the supervision of Master Ayub. Ayub has been running the school for over 27 years, and currently educates over 200 students without charge. The pilot phase for T2T was launched at the DSRA School in Karachi in 2013 where 46 students benefited from teaching assistance provided by Mobilink employees and recorded a 100% pass rate in their final exams. The program is now included in the annual activities of the Mobilink Foundation. Through T2T, Mobilink Torchbearers aim to tutor students in subjects including Math, English and Science. Mobilink Foundation continues to work in the areas of education, environment and health to raise awareness, impart knowledge and contribute positively towards communities.